This one has been in my possession for about a year. Bought it at auction for next to nothing. It is nice and tight. I cleaned and rehabed the entire thing. It looked pretty poor. It looks real good now. This piece has a 30 inch tube of 12 gauge bore. 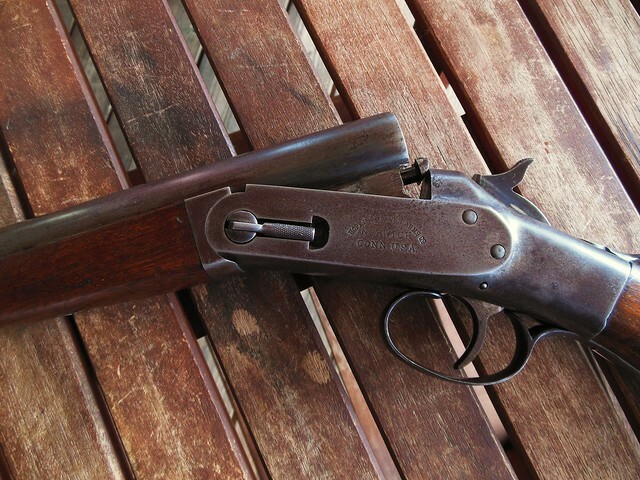 Like the rest of my old single shots, it shoots my brass hulled black powder reloads to full satisfaction. I have not spent as much time researching this particular piecs as I would like, but internet sources are spotty. I need a few good books to find the particulars that I look for. So with that, I do not have a production date or modle designation to post. This has become my favorite single shot to date. I fell in love with it as soon as I got it refinished. It is sleek and handles well. It also simply looks neat with the particular lines that were relegated to this version. 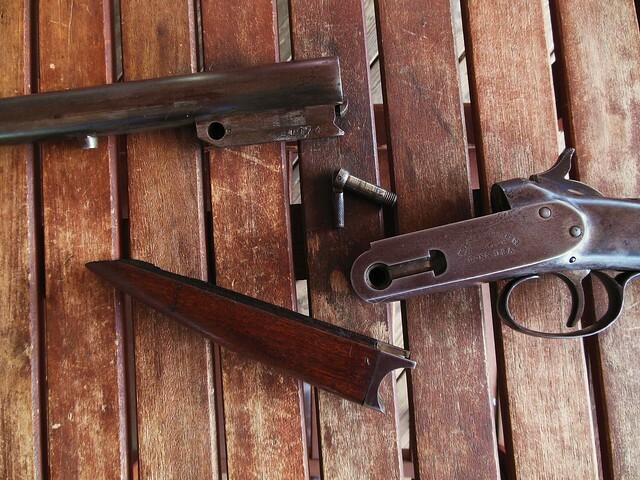 And of course, the barrel dissassembly lever that is recessed into the receiver is unique and of it's own accord. I will likely continue to pick up and shoot these old "put out to pasture" single shots for some time to come. They have a simple historical allure to me. Steve, you done good! I need to get back to some of mine. Thanks for the compliment mazo. Hi scooby, I would love to come across a nice BP shotgun like that. 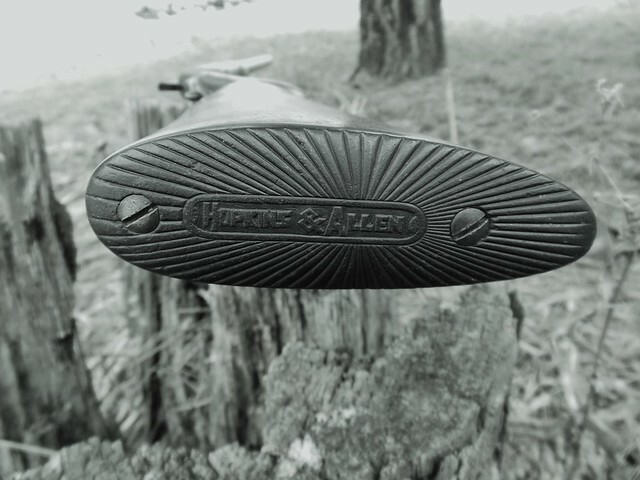 I have an old Hopkins and Allen .32 S&W top break revolver arriving today. 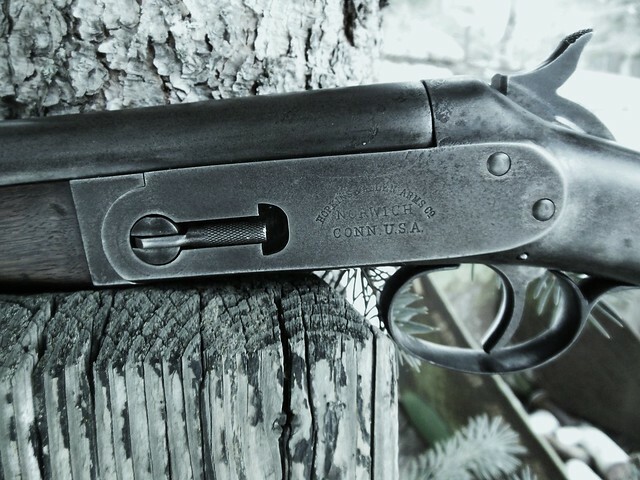 These old BP centerfires are part of our early history worth consideration for collecting. I have .32 S&W loaded with Trailboss for 1849 conversion cylinders, but concerned about shooting those in a strictly BP only gun. I guess the solution is to reload with BP for the .32 S&W. 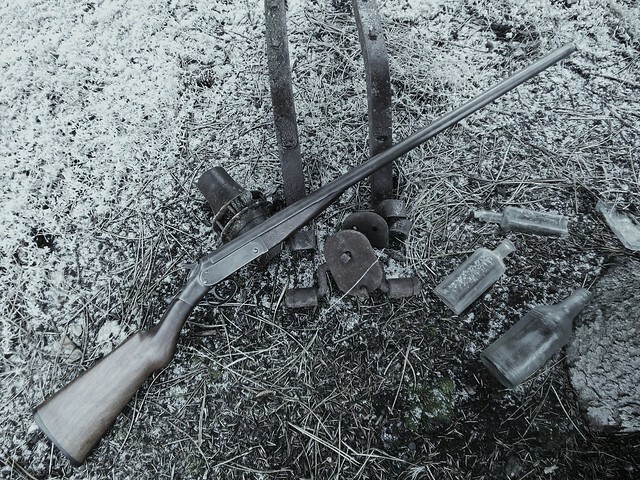 Guns were meant to be shot, even if over 100yrs old. The old single shots are pretty easy to find. You just have to look for the ones where the seller does not think they are worth a premium just because of age. And they do look pretty rough when you first get them, but some tedious hand work followed by a subtle refinish makes them into a piece that you would gladly show to friends. They still shoot very good patterns even though they are likely to have some pitting in the bore. Good luck with the H&A Top Break. It will be a fun project for you and I am envious. I also could not agree more. Guns were made to be shot. 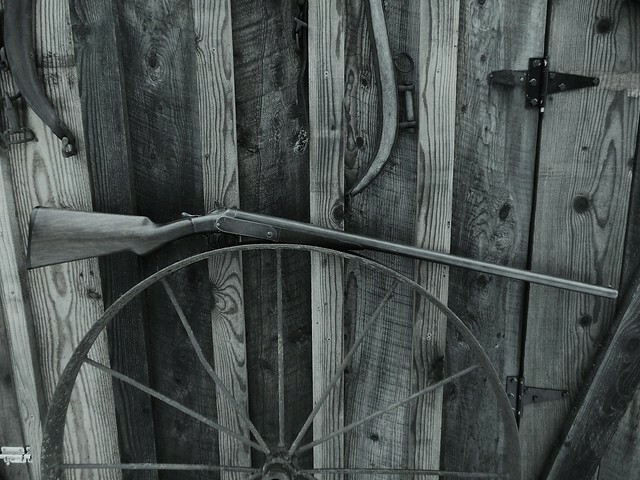 I shoot each and every one of my antique guns, even the muzzleloaders. What I like is the fact you don't go all banzai trying to 'refinish' or 'restore' them, but clean them up leaving the natural patina and honest wear intact. That and the B/W photos really helps! Thanks for the pics and the background, Scooby. Nice gun and nice B/W pics. 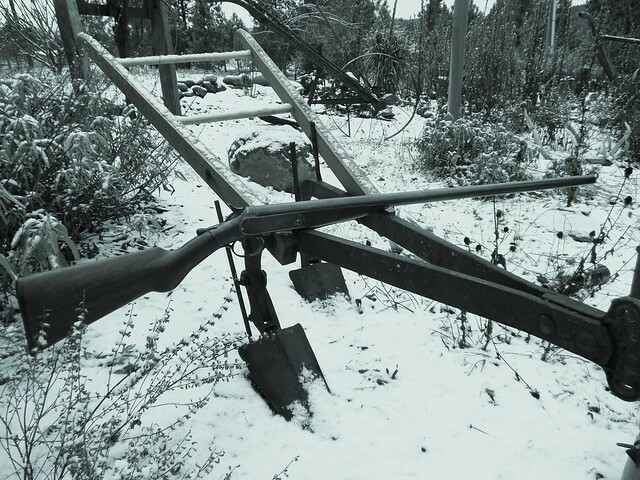 Also like the setting with the old farming equipment and horse tack. 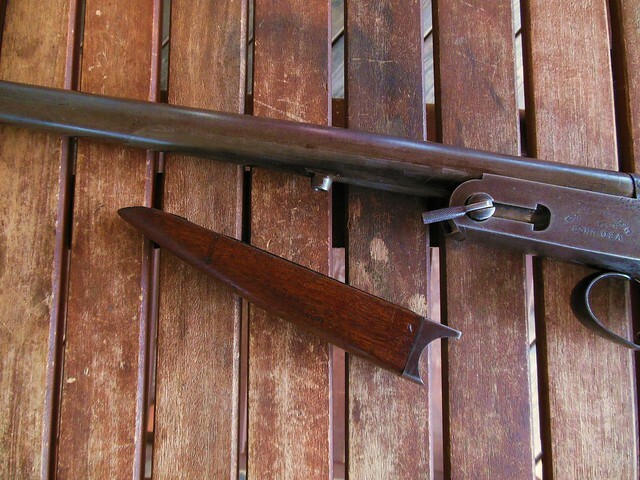 Would appreciate if you could add (just for my education) a couple of photos with the breech opened and something showing the unusual barrel dismantling solution of this gun. I will get a few additional pics snapped for you Len very soon. Give me until Friday Len. The recent snow will be melted back and I will be home when there is good light for taking pics. Well, the snow kept coming intead of melting back, so I settled for a few pics on my porch table. These pics should explain the workings for you Len. I like the "field" design of that shotgun. No screwdriver needed for dismantling.